- Handles well cookies, page redirects, VML, CMS! * free version has a floating limit starting at 3500+ pages & going up based on server load. See our current limit here. This Web-Site-Map.com service is named by Web Hosting Search one of the Best Web Tools "for providing outstanding XmlSitemap generator". If you happen to have broken links on your website, our Sitemap Generator will scan those and inform you if any are dead, and which specific pages need to be fixed. Creating XML Sitemap is easy with our free online XML Sitemap generator. To get your map file generated simply type in your URL and on the next page make selections for 3 optional parameters - page changing frequency, last modified date and page priority. See sitemap maker page screenshot. What is "Page changing frequency"? What is "Last modified date"? The time the URL was last modified. This information allows search engines' crawlers to avoid recrawling documents that haven’t changed. You can let the generator take the information from your server or specify your own date and time. The priority of a particular page relative to other pages on the same website. As Google specified the value for this tag is a number between 0.0 and 1.0 where 0.0 identifies the lowest priority page(s) on your website, and 1.0 - the highest. The default priority of a page is 0.5. Note that our map builder can generate page priorities for you automatically by analyzing relative positions of your web pages in the website tree. Uploading is very easy: just download the generated sitemap.xml file from our download page and place it into the root directory of your website (most of the time root directory is the directory where your index file is). Yes, web-site-map.com xml sitemap builder browses only web pages that are freely accessible by everyone. Content restricted by your robots.txt file from Google, Yahoo, Bing, and other search engines will not be included in your sitemap.xml file: the online generator script will simply skip it. Our free online Generator features unique combination of user-friendly interfaces with very rich functionality. The generator supports national languages (any local charsets and character encodings including UTF-8 etc) and has got a sophisticated retry logic to deal with distant hosts and slow networks. Page priorities can be either generated automatically or set manually. The Web-Site-Map crawler always obeys robots.txt files and follow robots.txt rules as per Google's recommendations. Web-Site-Map webbased service is 100% online tool. This means that you don't need to install any software on your computer, or upload any PHP scripts to your website. Moreover - you will be able to create your free site-map files on any computer no mater if it's Mac, PC, iPad, or Android device, and whether it runs Windows, Mac / Apple OSX , iOS, Android, HP WebOS, Chrome OS / Chromium, Linux or UNIX. Microsoft Windows 8 is fully supported too. The same is true from the content management perspective: you may manage you content manually or use CMS like Drupal, Joomla, WordPress, DotNetNuke, Magento - in all cases our HTTP crawler will always work well for you! 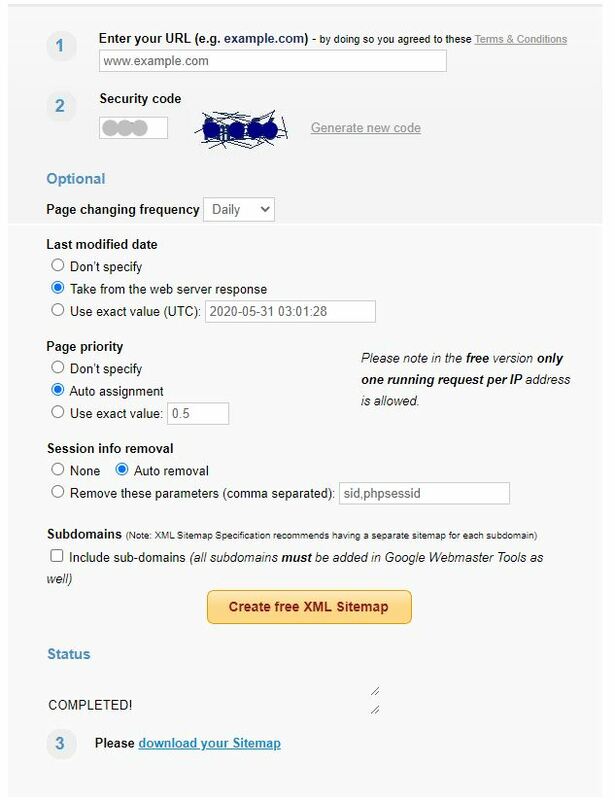 Our Google/XML/Sitemap creator comes with another useful SEO feature - a free broken link checker that detects and reports broken hyperlinks right while making your Google site-map. Note that in order to use this broken-links checker you need to make a map with our online xml sitemap maker. As an alternative way of addressing the link rot problem you can consider our brand new standalone broken link checker that is capable of reporting all major linking problems and HTTP reponse codes like 404 "Page not found" etc. So you can use the Link checking facility any time even without any google site-map files being generated. Remember to use Link Checker tools periodically to ensure constant health of your Internet resources. Joomla and other dynamic content management system are fully supported! Our online service is of a professional grade and offers a build-in Sitemap validator that validates generated site-map files and reports whether the XML is well-formed and valid. Note that wellformness and its compliance with the XML Schema are critical factors: otherwise Google, Bing, and Yahoo etc won't be able to understand your sitemap. Choose your generator as well as other SEO tools wisely to make sure that your web optimization efforts won't be wasted! This service is capable of handling any website no matter if it's coded by hand - with pure HTML / XHTML, or is based on PHP, ASP, JSP, Cold Fusion etc or is built using Drupal, Joomla, WordPress, DotNetNuke, Magento, or any other CMS and e-Commerce platforms. All this makes web-site-map generator a valuable everyday SEO tool for web designers and webmasters. Create your free map file today with our premium online builder and submit to Google, Yahoo, Bing, Baidu, Ask. More cool features are coming soon including higher free limits. No-limit commercial version is available - contact us for details! Make your web-site Google friendly by mapping it using our tool! Also don't forget to check our collection of SEO links for other useful SEOtools and website promotion resources! News: Subdomains are fully supported! We were receiving many requests to allow non-www domains. So that's accomplished! Now you can make XML sitemaps for main domains like example.com and sub-domains like forum.example.com etc: there are no limitations on URL name components anymore! If you happen to see any issues with this new functionality please don't hesitate to contact our Support. As you may already know we usually address any issues within 24 hours! More news: Improved support for Joomla! We are constantly improving our CMS compatibility module that got recently support for JoomSEO and Phoca Download extensions. If you have got a Joomla-generated website and see in your sitemap.xml files any unwanted dynamic links created by Joomla extensions please let us know and will take care of those promptly and for free of course! You will find more info on this, other news, release notes, and service announcements on Twitter. Please follow us! Have you tried our Broken Link Checker ? We recently added to the family of our online SEO tools a standalone dead link finder BrokenLinkCheck.com that detects bad links and highlights broken links' locations right in your HTML code. Finding and fixing stale hyperlinks has never been easier! The link checking tool makes results available in real-time so no waiting is involved: you can start fixing broken links right away while our broken link detector is validating the rest of your links!